A large financial decision loomed over the Mission in the mid 2000’s: what to do with the deteriorating landmark at 611 Reily Street. After attempts to relocate were denied by the city, a six-million dollar renovation project was undertaken on June 1, 2007. 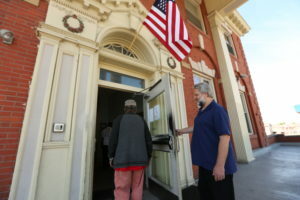 Just two years later on June 9, 2009, a celebration is held at the Men’s Shelter following the completion of its major renovation. The downturn in the economy over the next few years resulted in a three-million dollar debt that, in spite of a beautifully restored Men’s Shelter, put significant pressure on the organization. A campaign tor educe the debt was launched in 2012 called “Do a 180 for Bethesda,” led by Director of Development, Scott Dunwoody. The success of this campaign, which asked members of the community to contribute $180 each, allowed for the necessary reduction in the loan and secured the immediate future of the Mission.